WASHINGTON (Sputnik) - Former Trump campaign manager and White House chief strategist Steve Bannon wasted his opportunity at the executive office by engaging in leaks and backstabbing, the US President’s son, Donald Trump Jr., said in a statement. "Steve had the honor of working in the White House and serving the country," Trump Jr. said via Twitter on Wednesday. "Unfortunately, he squandered that privilege and turned that opportunity into a nightmare of backstabbing, harassing, leaking, lying and undermining the president." — Donald Trump Jr. (@DonaldJTrumpJr) 3 января 2018 г. Earlier on Wednesday, the Guardian revealed excerpts from the upcoming book "Fire and Fury" about President Donald Trump’s campaign and presidency. The book cited Bannon saying the 2016 meeting between Trump Jr. and a Russian lawyer was "treasonous" and "unpatriotic." Bannon is also cited as saying that investigators in the Russia-Trump probe were going to, "crack Don Junior like an egg on national TV." 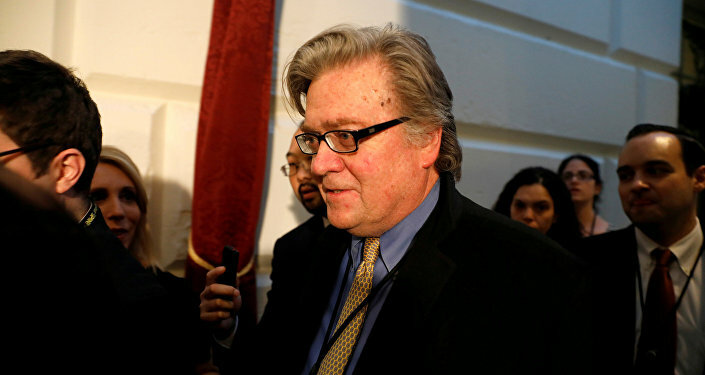 Trump responded with a statement on Wednesday in which he said Bannon leaked false information to the media and had little to do with his campaign victory. Russian officials have repeatedly denied allegations of collusion with the Trump campaign as well as meddling in the US election.